Drop a stone into a pool of water. The spreading ripples are gravity waves. The waves occur between any stable layers of fluids of different density. When the fluid boundary is disturbed, buoyancy forces try to restore the equilibrium. The fluid returns to its original shape, overshoots and oscillations then set in which propagate as waves. Gravity or buoyancy is the restoring force hence the term - gravity waves. These waves (internal gravity or buoyancy waves) abound in the stable density layering of the upper atmosphere. Their effects are visibly manifest in the curls of the stratosphere’s nacreous clouds, in the moving skein-like and billow patterns of the mesosphere’s noctilucent clouds and in the slowly shifting bands of the thermosphere’s airglow. What triggers them? The ‘stones into the pond’ are disturbances far below in the troposphere, for example, wind flow over mountain ranges and violent thunderstorms. Jet stream shear and solar radiation are other sources. An initial small amplitude at the tropopause increases with height until the waves break in the mesosphere and lower thermosphere. 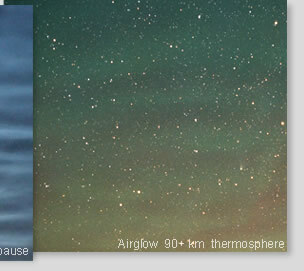 Their wavelengths can range up to thousands of kilometres. Their periods range from a few minutes to days. They do more than give clouds interesting shapes. They are vital in their role of transferring energy, momentum and chemical species between the different atmospheric layers and in the subsequent influence on upper atmosphere winds, turbulence, temperature and chemistry.